Oh Dear, Oh Dear Oh Dear!!!! Next up it’s the Super 8’s and if you can see where a win is coming from for the FC in the next 7 games, then you’re a better man than me! Talk about ‘after the Lord Mayors Parade’; what a come down that was on Thursday and what an indication of just how far we have to improve our mental approach to games too! We were quite simply outgunned and outclassed by a team who, from the kick off, wanted it so much more than we did. As a weekly chronicle of an average fan these Diary’s seem to bump along through periods of mediocrity and flat-lining, before suddenly peaking with great moments of hope, as was the case over the last two weeks. Then of course they are invariably thrust back down again into the mire. It’s not just the Diary’s that suffers that way either, because it’s the lot of us fans too isn’t it? But that’s the ‘crack’ when you’re an FC supporter and it has been that way for years. They simply build you up, to shoot you down!! Despite all the pre match talk about us stepping up and ‘hitting the trail to the top four running’, we all probably suspected that it was never going to happen, because we came up against a team that was better prepared, more focussed, mentally stronger and much better drilled. Every Wigan player knew exactly what to do and when to do it, every tackle had three men in it, every break had at least two supporting runners and as early as the first couple of minutes, it was painfully obvious that we just couldn’t hold the incessant ‘push’ and movement of the visitors. You could sense their single-minded approach to it all and almost smell their enthusiasm and you know, I believe it’s a fact that, as was the case against Leeds in the Cup a few weeks ago, we can’t compete with teams with that sort of application, when they’re on their game. We have instead to hope that we catch them on an off day, when we might just have a chance of slowing them down. However if we can’t do that then we’re stuffed and that’s just what we were on Thursday! Stuffed!! In addition I would add that judging by that showing I think we should all prepare for more of those type of ‘stuffing’s’ in the coming weeks. 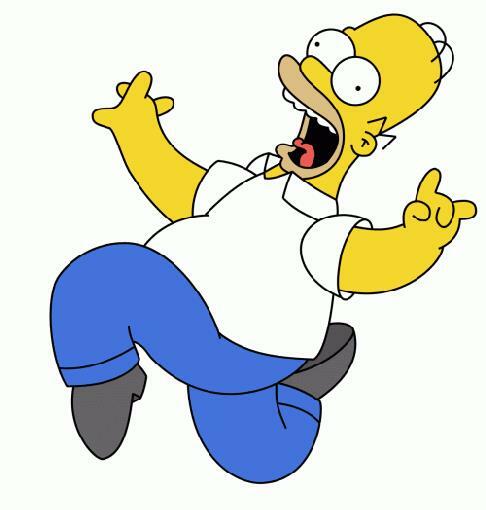 WOO HOO…..SUPER HULL ….IN THE SUPER EIGHTS!!! What a night and what an effort! I’m still living in the afterglow of an extraordinary evening and just so proud with the way that, despite so much adversity, we went about the task of getting a win at any cost. Massive congratulations to Lee Radford, the rest of the coaching team, the support staff and the players for achieving our first (and what has seemed at times an often unlikely) objective of the season; a place in the top 8 and thus the guarantee of Super League rugby next season. Whatever else some would say you got wrong Lee, you got us through and the team spirit of Friday was unquestionable!! To beat Rovers, even a poor Rovers, at their own home in front of that red and white rabble is always pretty OK, to keep ‘the entertainers’ scoreless in the second half is pretty good, to get bragging rights for the closed season is heartening indeed, to win the regular rounds 2-1 is very good, to beat Rovers to secure a top eight place and Super League survival next term is great and to secure a win that leaves them on the brink of the group of death is brilliant. However to do all that with our two most senior players carried from the field in the first half, is bloody awesome!!! In fact, despite all the despair and frustration, the disappointment, ensuing ‘Coach bashing’ and dissatisfaction that went before, as FC fans we could not really have wished for more of a ‘fairytale’ ending to the initial rounds of Super League. Walking round Beverley on Saturday afternoon I haven’t seen so many smiling faces from folks proudly wearing their colours and patting their badges to everyone that was similarly dressed. The thing is as well, 48 hours later, I still feel just as ‘pumped’ as I did then! Woo Hoo!!! That was a great win and how we needed it! Yesterdays was a victory that not only got us two precious points but one that, as my pal Kathy said, made our hearts race in that last few minutes. It wasn’t brilliant and decidedly nervy at times too, but it had the excitement and passion that you want from your rugby, as a scratchy first half was eventually forgotten and it became a good afternoon all round. We all sat there in the sun, watching helicopters and tracking Rovers progress on our mobiles, as on the field Hull FC just hung on!!! That’s what true cross city rivalry is all about I guess; we win they lose, I’m happy!!! Castleford showed in the first half that they are a well coached and well drilled team, they work hard for each other, but most of all they control the ruck. In the first 40 minutes we allowed them to play the ball far too quickly and so I guess they deserved their first half lead. However much like those resolute under 19’s the day before at YPI, we roared back in the second half and indeed in the end points wise, we probably deserved a greater victory. I think we crossed the line 8 times only to have 4 ‘tries’ either ruled out for offences or because our player was held up. Looking beyond that great win against an in form Castleford, it has however for this fan at least been another tough week off the field. For me the ‘shadow of merger’ still hangs heavily and despite the two Clubs protestations, and the odd vociferous supporter on social media it’s something that for this fan at least, just won’t go away. Watching those Under 19’s at YPI on Saturday didn’t help either, it was pretty heartbreaking as the countdown to my last academy game gains pace and the prospect of no more derby clashes after this season at that level, kicked in. A brilliant fight back by a depleted FC Academy did nothing at all to change my mind and judging by the bumper bundle of mail I got this week, I don’t appear to be on my own with that one. Don’t go thinking everyone at the Clubs think it’s a good idea either because they certainly don’t. Several cited to me the fact that it took Wigan and Leeds seven or eight years to get where they are now, while we’ve only given it two in our new set up at Bishop Burton. 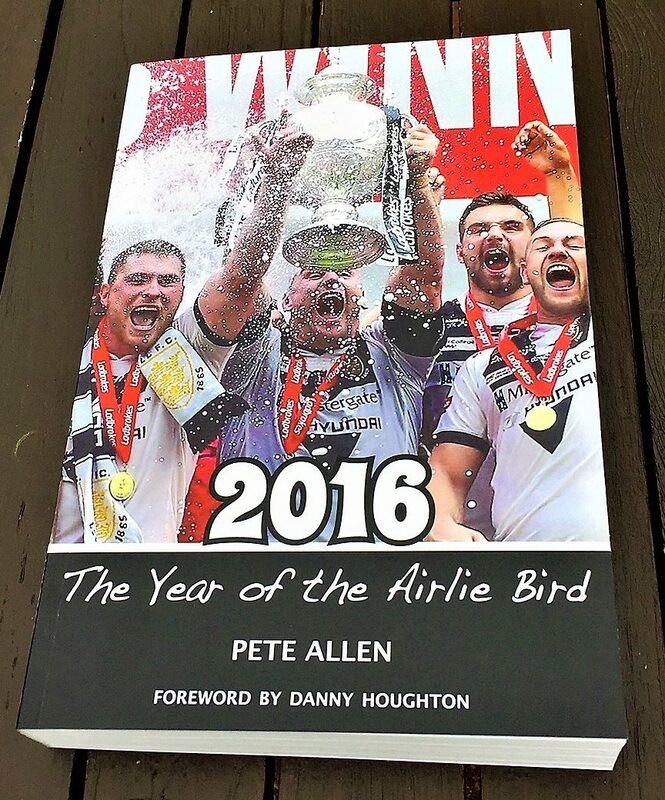 In turn Wigan Coach Shaun Wane said this week, “Although it’s a good idea for some of the other Clubs, we won’t be amalgamating with anyone” Then Adam said in his programme notes that as both Clubs have only had a limited number of callers on the subject “….it would suggest that a good majority of people support and understand the idea”, well perhaps that’s the case, but I don’t!! Yesterday 8 of the lads on show in our team came through our ‘failing academy’ and I can only conclude that perhaps at last it’s starting to really bear fruit, but now I guess we’ll never really know! Hello and welcome to the 450th edition of this Diary! I have to say however that instead of a celebration, it’s pretty sad to report that it is an anniversary marked by a really torrid week that featured actions that could change the face of the Club we all love forever. Still we got a win against Wakey at the second time of asking and despite it being far from convincing, we are once again back in the eight….for now! 20 years on and little changes does it? Regular readers will know that, in here at least, I try not to knock the owner and always attempt to do my very best not do the same to the Coach and the players, I always try and understand the difficulties they all operate under, the issues, the pressure, the financial woe etc. etc. and because I love my Club it is almost with blind faith that I support them in what they do. This week though has been tough and although not wishing to over dramatise things, I have to say that this merger idea is at present the last straw for a lot of us old timers. I know things move on and you can’t live in the past, but let’s get one thing clear from the fans side of things and that is the fact that at least as far as we are concerned, we don’t merge ANYTHING with Rovers. As you get older you realise that, not just in sport, but across all aspects of life, there are those younger than you who just pay lip service to heritage. They don’t understand the past although sometimes they pretend they do. I think at Hull FC we are lucky because fans young and old really do appreciate our history and what it was built on, whilst I hope we also have the foresight to celebrate and embrace our future as it is manifest in the youngsters we bring through the Club we love, right to the margins of the first team. Across all sports Owners, Directors and benefactors get all that too, in varying degrees, but invariably in the end, in modern times, it all comes down to money! For many, many years I have attended the Academy, A team and even, way back when, the Colts games, because I love to watch honest genuine lads, often from FC families I have grown to know over the years, wearing their Club strip with pride and doing their best for my Club, particularly in those great junior Derby games that the players themselves simply live to play in. That’s when they get the chance to live out their dream and do battle with the enemy, because that’s what the way that they and thousands of us fans see Rovers!! They are the mortal enemy! I won’t be going to see the blue and gold’s next season, in fact I’ll have nothing to do with them, funnily enough, Hull FC teams merged with Rovers and playing in Leeds colours don’t do much for me!!! Believe me, after years of antagonism, mocking, goading and downright bloody mindedness from everyone from their fans right up to their chairman, I just can’t suddenly embrace them or go along with any sort of MERGER! I won’t even stand in a Supermarket queue with someone with a Rovers shirt on, so this is far beyond the pale for me and I’d find it absolutely impossible to stand there with a load of Rovers fans all cheering on the same team! Forget that!! Dozens and dozens of upset supporters have contacted me since Thursday morning, but why shouldn’t they be upset, because as Sports fans we define ourselves and our lives through the teams we support or indeed through the one’s we don’t! That is in our very DNA and you can’t meddle around with it in the name of cost cutting and not expect a backlash. As always these are just my views straight from the heart and no one has to agree with them, that’s the whole idea of this diary, I ain’t trying to whip up antagonism or protest because I love Hull FC, in essence I’m just an old sentimentalist who is perhaps ready to be put out to grass, but personally I’m totally deflated about it all and as it took the crowd at the KC yesterday 66 minutes to even muster a chorus of ‘Come on You Hull’ they too certainly looked like a group of people with their minds on much bigger things. But more of that later! Make your voices heard about the Hull FC and Hull KR Academy merge. 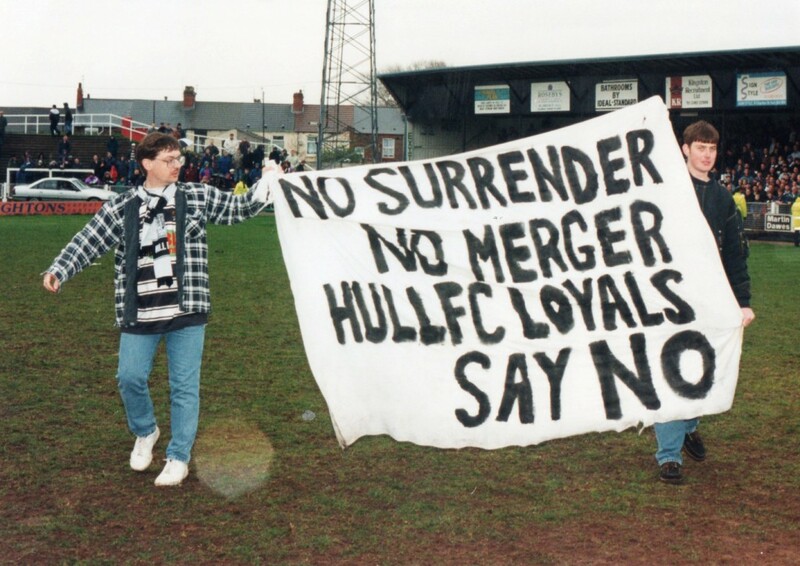 Sign the #NoToHullMerger petition today!